Yemeni activist and Nobel Peace laureate Tawakul Karman talks about the women of the Arab spring. When, in October, Tawakul Karman heard she had become the first Arab woman to win a Nobel Peace Prize, she was sitting in her tent in a miles-wide protest encampment in Sana’a, the Yemeni capital. She had been prevented from leaving it for the previous eight months by death threats. “I learnt about it through the media,” she recalls over mobile phone en route to a meeting in New York. 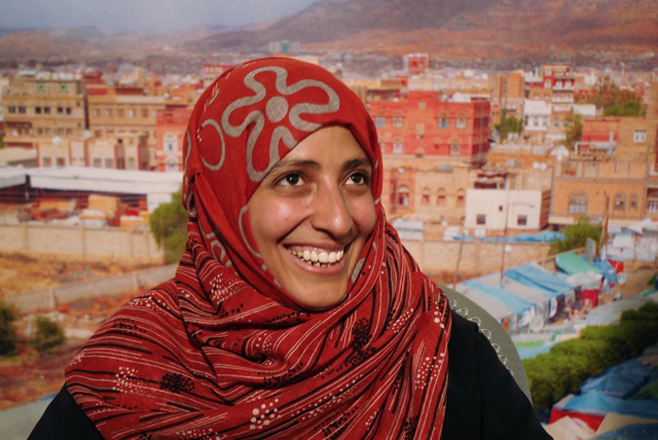 Since the award, which she shared with two other women, catapulted her to international fame, she has put down the microphone – through which she exhorted Yemen’s ragtag revolutionaries to bring an end to the 33-year rule of President Ali Abdullah Saleh (at the time of going to press, he had promised to step down at elections early next year) – and started lobbying international policymakers instead. At 32, Karman is still young, and there have been many who interpreted the Nobel committee’s decision as a partly symbolic recognition of the hundreds of thousands of women who have marched, fallen, shouted, sewed and bandaged for freedom during the Arab spring, staking their claim to the public sphere in societies which have often sought to keep them out of it. The laureate herself dedicates the award to “the youth of the Arab spring, women and the Arab spring, and the women of the Arab revolutions.” Political theatre may be of limited value to those seeking gender equality in the Middle East, complicated as their struggle is by a backdrop of violent instability and thorny questions about power, imperialism and the role of Islam in society. But it has its uses, and few are better equipped to occupy centre stage than the dauntless Karman.